Wow! There goes another month! And what a month it was. 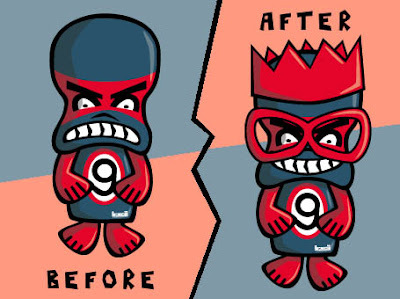 A month in which we finally got a new, and much needed, KawaiiPunk logo makeover, and myself and the Grumpy Mascot also got some slightly less needed makeovers ourselves! And along the way we also got to see the fantastically cool works of ClumsyPlush, Twistyfishies, and Paper Biscuit to name a few. And, of course, there was also our monthly puzzle! 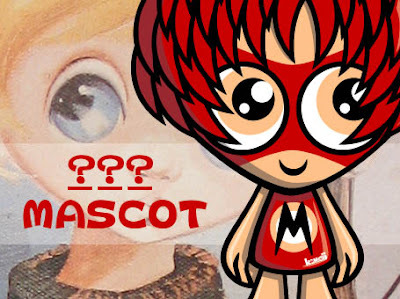 Did you work out the name of our newest mascot? Yippee! Just when I thought I was the only lover of all things mischievous left on the planet, I find this groovy little guy! And, as if that wasn’t enough good news, I also find out he’s got his own Zazzle store too - packed with t-shirts, caps, mugs, buttons, bags and more! And all of them as cool as they come! 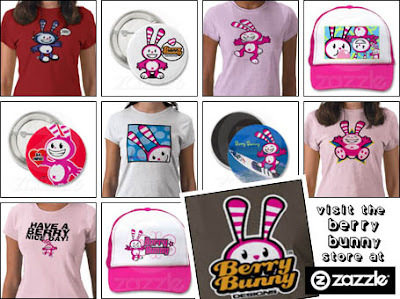 But don’t just take my word for it, even though I’m right, head on over to the Berry Bunny store and have a look for yourselves! You won’t regret it! Yes, you’ve guessed it! It’s a Christmas card with a picture of yourself on it! Unfortunately, once again, I have absolutely no idea who in their right mind would consider using such a card, but at least they’d have option to do so if the desire took them! Which it probably wouldn’t! But hey, maybe you could send it to yourself? I mean, you are a freak after all! See what I mean? The shop is called Paper Biscuit and I found it while browsing through my favourite place in the whole world wide web - Etsy! Paper Biscuit sells astoundingly cute earrings, necklaces, rings, and bracelets that will bring smiles to the faces of all who see them. 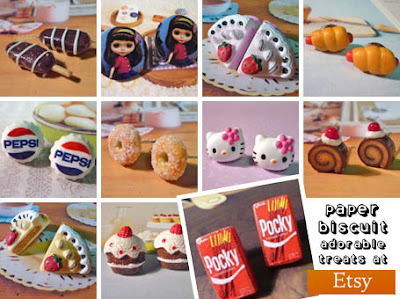 And believe me, these are the kind of cute accessories you’ll want people to see :) Enjoy! Ta da! Impressive, isn’t he? But wait, it seems that there’s something missing! Well, it wouldn’t be much of a puzzle if there wasn’t! So I guess that’s why there is! If you get what I’m saying! But enough tomfoolery! The question is… can you work out the name of this new “sixties inspired” “big eyed” mascot? Hmmm… did I just give you a clue? Find out when the answer is revealed in this month’s monthly round-up! As you can see I decided the best way to improve your image was to make you less grumpy looking! I have done this by giving you a party hat, a pair of oversized comedy glasses and, most importantly of all, a smile! I think the result is simply fabulous, and what’s more, I won’t even charge you a penny for my services. Hope you enjoy it! Is this some sort of joke? Did the Mischief Mascot put you up to this? I mean honestly, getting me out of bed to waste my time with this nonsense? Haven’t you people got anything better to do with your time? Cool, isn’t it? 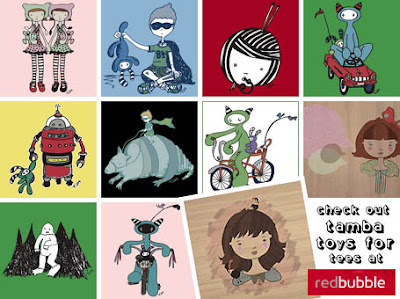 At the Tambatoys store you can pick up beautiful t-shirts and cards - all adorned with some truly adorable and original artwork. Bunnies, birdies, robots, and yetis are all in attendance, as well as a good few other characters too! And every single design is as stunning as it is stylish! 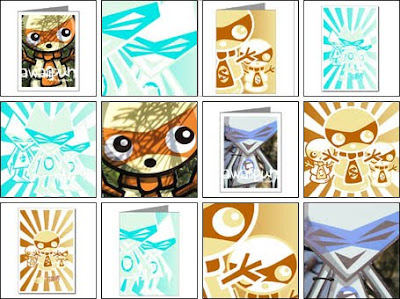 And, as if that wasn’t enough for you lucky readers, there’s even an armadillo t-shirt too! How cool is that? 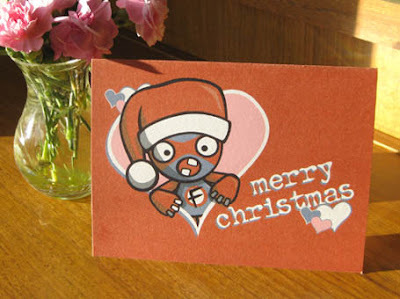 Yep, that’s right, it’s the fantastically festive KawaiiPunk Christmas card collection! Woo hoo! Now you can amaze your friends and family by sending them cards with myself and my good friend the Snowman Mascot on them. How cool is that? No pun intended! 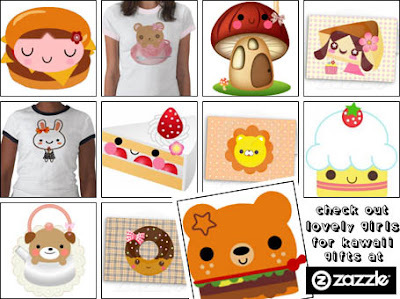 All you have to do is head on over to our Zazzle or CafePress shops and you can have your very own kawaii Christmas! Ho ho ho! 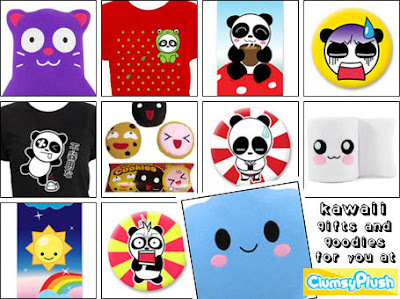 What you are looking at is just a tiny fraction of the incredible kawaii goodies available from the equally incredible Lovely Girls Zazzle shop! And what a shop it is! Packed with over a thousand super cute products, the Lovely Girls shop can truly be said to be a one stop shop for all things kawaii! Looking for cute t-shirts? They’ve got them! Want some sweet stationery? Step right up! Fancy a kawaii skateboard! No problem! 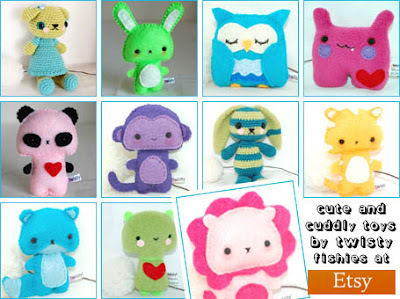 In fact, this shop’s got so many cute goodies, you may never have to shop anywhere else again! Brilliant, isn’t it? As you can see I’ve decided to give you contact lenses, a new hairstyle, and a bowtie - because everyone loves bowties! And, even if I do say so myself, I think it improves your looks ten fold! If not, more! And best of all, as I’m sure everyone will undoubtedly agree, with this cracking new image you’ll never be called a nerd again! Because I have heard that happens quite a lot! Sorry! Thanks Tamara. It’s always nice to hear from our regular readers. And a relief to know we actually have some! 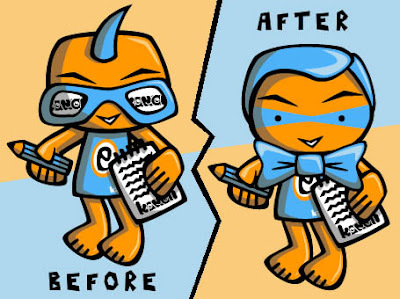 And thanks for the mascot makeover mock-up too! I’ll be sure to try it out some day, if I’m ever invited to a “dress like an oddball” party that is! New KawaiiPunk Logo! At Last! Pretty cool, isn’t it? Unfortunately however, at the time of writing this post, the only place you’re going to find this new logo is right here! In this very post! But fear not folks, because we’ll soon be rolling out this new logo on all our KawaiiPunk websites and shops! And we’ll probably be featuring it on some t-shirts too! Although given it’s taken two years to get this far, I don’t think I’ll be holding my breath! Still, better late than never! Ta da! ClumsyPlush is a fun finders dream come true, packed with some of the cutest characters you’re ever likely to see! And with everything from t-shirts and buttons to bookmarks and toys, it’s also got some of the cutest goodies you’re ever likely to buy! So the next time you’re looking for a bit of kawaii cheer, you’ll know where to go! Enjoy yourselves, folks! A laborious and repetitive task will drive you to the brink of madness this month! Congratulations! It’s time to write those Christmas cards! The early bird may catch the worm, but unfortunately he doesn’t sell them! Remember this to avoid an embarrassing fishing trip incident! Now’s the time to start dropping those hints about that Christmas present you want! Unless you want socks, in which case you’re already sorted! An unwanted visit from an unwanted guest at an unwanted time will lead to an unwanted situation! Still, at least it’s nice to be wanted! A potentially embarrassing event looms ominously on the horizon this month. Start think of excuses now to get out of that office Christmas party! Avoiding anything with the word “avoiding” in it is the key to avoiding trouble this month. Woops… I’ve done it again, haven’t I? Congratulations! A whole load of luck is headed your way this month! Although I can’t tell whether it’s the good or the bad variety! Sorry! Competing in a world championship table tennis tournament could spell you downfall this month! Still… shouldn’t be too hard to avoid, should it? An utterly pointless yet amazingly accurate horoscope prediction will be read by a Capricorn this month! See below for proof! An utterly pointless yet amazingly accurate horoscope prediction will be read by a Sagittarian this month! See above for proof! Saving money on Christmas presents in the current financial climate is indeed a good idea! Doing it by not buying anyone anything isn’t! You have been warned! A chance encounter with an irate omelette salesman could leave you with egg on your face. Avoid irate omelette salesmen and you should be OK!